Warning, long read ahead. Pics and videos throughout. This is a new prop for me this year. I call it the Diamond prop. Lights, Controllers, Network, and Materials. I used a Pixie16 with 50 Led Strings. I chose bullet pixels because originally I was going to build it much smaller, thus the bullet pixels would fit closer together than the square pixels. As I started to design it and working out the math and geometry and thinking about what size I wanted this prop to be. I ended scaling it up to the present size. The size of this prop will will fit into my current layout much nicer. This prop is not a square turned on it's side to create a diamond. In order to use all 800 pixels of the Pixie 16, I had to modify the geometry some. The bottom two lines are 13 pixels long, whereas the upper two lines are 12 pixels long. 13+13+12+12 = 50 pixels. Keeping in mind that each corner of the diamond has it's own starting pixels, the pixel size of this prop is 14 pixels for the bottom lines and 13 pixels on the top lines. This still comes out to 50 pixels per diamond, it's just the shape has been modified to allow for the starting pixels. The over all size (pixel to pixel) is 98 1/2” wide x 108” tall. When I cut this out, I added a 3 inch border so the pixels would not be right on the edge of the frame. The inner diamond (no pixels) is 27” wide x 30” tall. Overall it's a big prop. S5 Version and License Info. I am using ver 5.2.2 Pro License and I have a 40 CCR License for Superstar. All the images and effects shown in gifs and videos below were created using these Licenses. I used two 3 mil sheets of Corex (known at Home Depot as Coro-Plast) 4' x 8'. The frame was built using 4 – 2”x 3” x 96” studs and 1 – 1' x 3” x 96” board and assorted screws and fender washers. The prop is very light, easy for one person to carry. At work I have access to a 5' x 10' Router table and design software. This prop could have been designed by hand, but was much quicker and a whole lot more accurate using the design software. For instance the very outer row, is spaced so that the length of wire between pixels fits into the mounting holes without stretching the wires. The bullet pixels that came with the Pixie16 are 12mm in diameter, I setup the software to cut a wee bit smaller than a 12mm hole. A 12 mm step up bit should work fine. The holes cannot be larger than 12mm or the pixels will not hold tight. Since this prop was designed with software I am able to create a .eps file of the full size hole layout. If interested let me know, I can post this file. You should be able to take it to any Print Shop that has a large printer and get it printed out to use as a template for hole placement and drilling. FYI, Sign shops have large printers. I like to build my props in LOR first before I spend the money on a controller and lights. This assures me that it will create the effects I am looking for and that I get the most bang for my buck. When I built my Blade Spinner, I was able to use the Group Arrangement called "Nested" in a very limited way. I knew the next prop I built would take more advantage of the Nested Groups. Nested Groups work well when the props has staring points that radiate outward from the center, hence the “nested” terminology. This Diamond prop is constructed using 64 “Lines Unconnected”, therefore every line has it's own starting pixel for a total of 64 starting pixels. The diamonds are constructed from the center outward, meaning diamond 1 is the center, and diamond 16 is the outer diamond. Each diamond has 4 starting pixels located at each tip (corner) of the diamond. This layout of starting pixels is important to be able to use the Nested Groups design successfully. Groups, Groups, and more Groups. Groups within S5 are very useful for getting the most out of your prop. In the example below the effect I am using is the Wave effect, as you can see that same effect using the same settings displays differently on the prop when applied to different Nested Groups. Instead of having just the one Wave effect, I have 3 other effects that can be used in sequencing all because of the use of (Nested) Groups. Actually I have many more effects when I tweak the setting in the wave effect. Currently this prop has 28 groups. Some groups were made just to group certain pixels so that they could be used in another group. I am still in the process of creating new groups as this prop is very versatile. As of now I am using 6 major groups to create effects with. When I get more time I will create more examples of other effect using the Nested groups that will show the results of clever grouping. This is a big prop, and because of the Nested groupings I can create many more effect for than what is offered in the Preview Group. It was an easy build, it took me a weekend to paint, frame and assemble. I built this prop many times in LOR S5 using different groups and had test sequences ready and running when installing the lights. If you are thinking of building new props I encourage to think of the design aspects and what can be possible using creative grouping. Build it in LOR S5 first, apply as many groups as you can so you understand what effects will be available. Right now the prop is in my basement and I cannot turn it to video it because it is to tall for the roof, which is ok because it is cold and rainy outside, inside it is warm and the beer is cold. In the next few days I will move it to the garage where I will take more video of it. This will give you a feel for the size of this prop. The effects are really cool for it. Nicely done! This is a great example of how to use nested groups in Light-O-Rama to achieve effects not originally possible in a traditional layout, or even the custom layout. By breaking down an element into further subgroups, you can have additional flexibility in programming -- as Alan's exhibiting. Here's a video of the prop in the garage. (too big to stand up in the house for testing) The video shows the Preview of each effect first then shows how the same effect changes when applied to "Nested Groups". I mis-spoke in my original post. I said the file I could save from the design software could be saved in the .eps format. I found that an .ai file would be better for a print shop to print. I stoppped by a Fed-Ex Office Printing store, I was told they could print it for roughly .89 cents a square foot. A 10' x 10' pattern should only cost $9.00 to print. At that store they would only be able to print the file on 36" wide paper. So the pattern would have to be taped together to make a full pattern. Here is the .lpeprop I am currently using, If you want to look at it and see how I arranged the Nested Groups. Wow! Some really great effects there, Alan. Thanks for sharing this. I'm inspired to start experimenting a bit more. Are you saying that you took String 1 and broke it down into 4 channels with Channel 01 having the first 13 pixels/nodes, then channel 02 has 12 pixels, Channel 03 the next 12 and channel 04 the last 13 pixel of that string. String 2 would be channel 05 and so forth, or am I confused again. With this being a Large prop and a light frame are you placing on a wall? Also would love to see all the nested groups when you get done. Just getting started with RGB Devices and have LOTS to learn. With the exception of a terminolgy word change - Yes, that is what I did. Rather than use the word "channel" (to avoid confusion for actual rgb channels) I would use the word "sections". I named the sections the way I did, to ease the confusion in keeping track of the 64 sections. I did a lot of copying and in doing that it renames the prop. The key to understanding the 64 sections is in the naming. Here is the .lpeprop file for this diamond prop. Feel free to download and play around with it, both in Preview Design and applying effects to it in Sequencer. Here is also a short gif from the Preview design that shows how each diamond is constructed in relationship to the other diamonds. Alan, First off S5 is just kicking my A##. I got to the point that I could see all of different lines in the prop, I could preview one segment at a time but when I tried to do a play back I got a message about needing to be in enhanced mode?? must not have something set up correctly, don't know why that would have changed from S4, but not your problem. Ok so we change channels to sections but where does the 64 lines unconnected come from / to, is this a Super Star term? Still, way Cool but how do you keep your arms around all of it, all the options would take me weeks just for this one prop. Here is a step by step video I started to make alwhile ago. I had made a huge mistake in it and put it aside. I found it again, and made the corrections. This should further explain how I made this diamond prop. It gives some insight into building props within S5. Note near the begining, you must use a "Enhanced Network" for this prop. It shows the setting you need to set. Thank You, thank you, thank you. This helped in several of ways. Forgot to hit Submit Reply, might have hit the snoozzzzzzzed instead. do you sell the coro with the holes in it already? I would be willing to buy it. if so, let me know. Sorry, but no I don't sell the Corex already drilled. It would be almost 2 full sheets (4x8), bending them would be more trouble than it's worth. The cost for shipping would be pretty pricey I suspect. Jeff F took me up on my offer for the design file, so he could have someone near him print a pattern. I have not heard back from Jeff F as to whether he got a printed copy done yet. Also above I called the file format an .eps, this would be the file for the router to cut the holes and size of the corex more local to you. 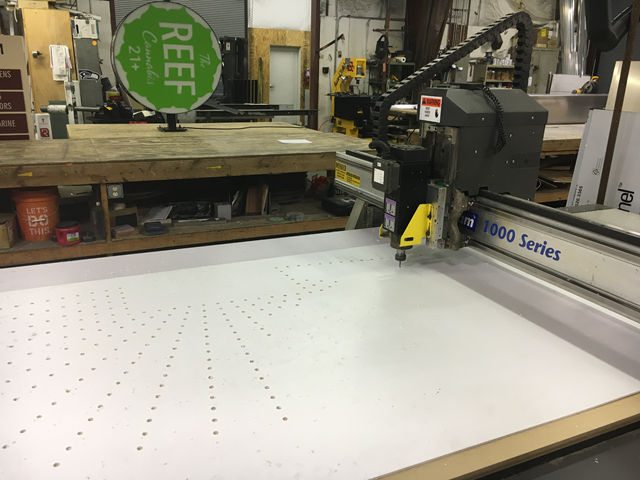 Sign Shops are a great place to start, as most use table routers. I also created an .ai (Adobe Illustrator) file for printing the pattern out so you could drill your own holes. These files can be printed at a Print shop that has an oversize printer. If interested in the files, PM me and I'll send your way.